Pivot points are commonly used by traders to identify key Support and Resistance levels in the markets. This indicator allows the user to display Pivot points from higher time frame charts (ex. Daily Charts), on lower time frame charts (ex. 15 minute charts). This allows you to see longer term support and resistance levels, while focusing on shorter term price movements. Do you have a version of this indicator that is compatible with NinjaTrader 8? if yes, could you please send the link for download. much appreciated. The indicator is not available for NinjaTrader 8 yet. It will be posted on this page and an update will be sent to our mailing list when it is. 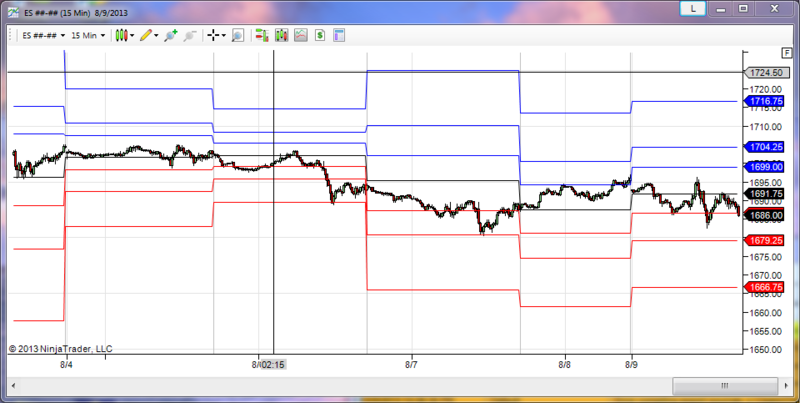 I downloaded your Support and Resistance Indicator for Ninjatrader 7 about 2 weeks ago. I like the indicator because price seems to react to the levels. I am planning to move to Ninjatrader 8 soon. 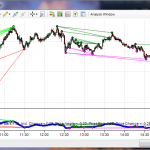 Is the Ninjatrader 8 version going to be released in the near future? I am happy to hear that you like the indicator. I do not have a time frame for getting the indicator programmed in NinjaTrader 8, but if you join the mailing list you will receive notification as soon as it is available.